San Jose, California: Cari Ferraro, 2016. Edition of 12. Custom cloth-covered lidded box (12.1.75 x 10.5 x 1.175") containing two books. Each book: 1.5 x 11.175"; 28 pages. Calligraphy and watercolor paintings by Cari Ferraro. Created digitally and produced on an Epson 3880 on Arches Text Wove paper. Archival prints in handsewn signatures. 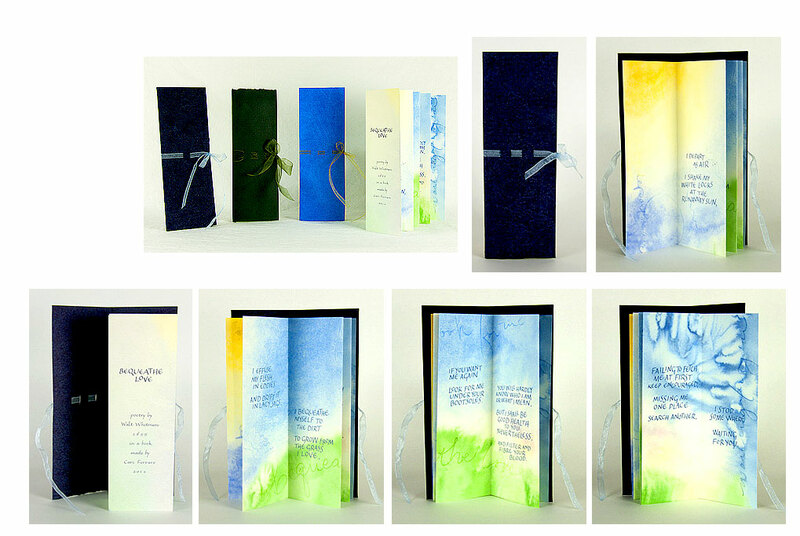 Bound on grosgrain ribbon in soft covers of painted Rives BFK, with painted endpapers of translucent vellum paper. Signed and numbered by the artist. Colophon and signature on separate piece of paper (11 x 4") folded in three and laid in. Two poems written by Mary Hunter Austin, published in her 1928 book The Children Sing in the Far West, but written many years earlier when she taught in the Owens Valley in the eastern Sierra of California. Colophon: "The poems in Morning Prayer / Evening Prayer were created by Mary Hunter Austin in the late 19th century. As a young schoolteacher in the eastern California desert, she wrote them for children; thus they are informed by a childlike wonder we feel in the presence of the numinous. "The poet often felt the land speaking to her; and her work answering.… Her sensitivity to the shape of the land informed the silhouette of [the book's] paintings. These horizons asked for space to be seen and entered. Most of the design decisions, from page width to paper for the prints, were made in keeping with the tender feeling of sunset and sunrise, and a quiet interior sense of prayer." Poemhunter.com (accessed 1/26/2017): "Mary Hunter Austin (September 9, 1868 – August 13, 1934) was an American writer. One of the early nature writers of the American Southwest, her classic The Land of Little Rain (1903) describes the fauna, flora and people – as well as evoking the mysticism and spirituality – of the region between the High Sierras and the Mojave Desert of Southern California." San Jose, California: Cari Ferraro, 2011. Open Edition. 9 x 3 x .25"; 8 pages. Concertina-folded. Reproduced from original watercolor painting and calligraphy. Printed two-sided with archival pigment inks on Arches Text Wove paper. Wrapped in heavyweight handpainted paper. Ribbon closure. This is the open edition of Ferraro's book Bequeathe Love, which had original watercolor paintings and calligraphy. Cari Ferraro: "The book is of a size which may be held in the hands and read while turning pages, or displayed out of its wrapper for the full painting. The pages make interesting use of the writing in the landscape, for instance, the fold breaks 'bequeathe love' into 'the love' on one page spread. The landscape writing was made in the wet paper before paint was applied, allowing it to become the land, sky and wind of the earth." I effuse my flesh in eddies and drift it in lacy jags. If you want me again look for me under your bootsoles. I stop some where waiting for you. San Jose, California: Prose and Letters, 2007. Edition of 53. 4.625 x 3.625"; 16 pages. 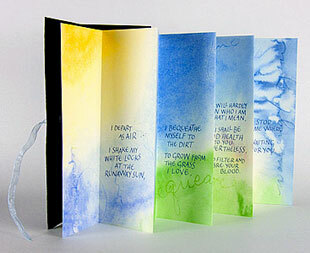 French fold accordion book, printed and bound by artist. 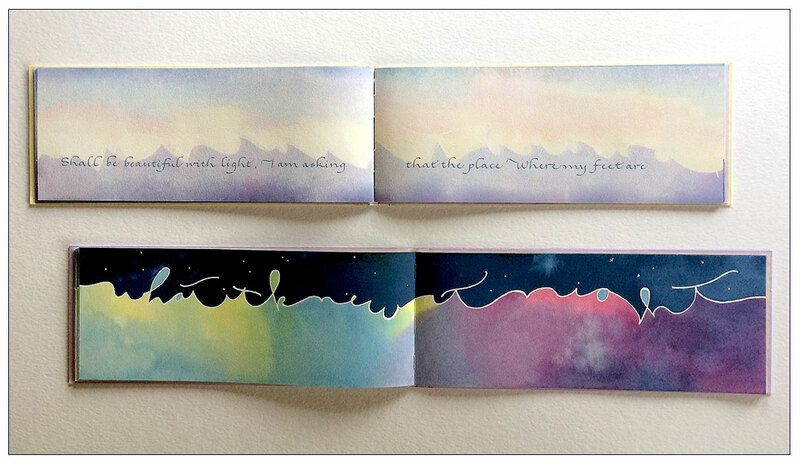 Pages digitally printed on both sides of Zerkall book paper with archival pigment inks. Background reproduced from a watercolor painting, on which the words STAR SPELL were lettered large in resist, and the paper then painted in layers of watercolor to reveal the words in the twilight sky background. 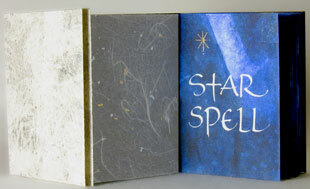 Stars handpainted in iridescent ink on front cover and two interior pages. Text lettering reproduced from original calligraphy. Flyleaves of sheer Japanese unryu "cloud dragon paper" with silver and gold flecks. Book sewn into hand painted paper cover which wraps around, the front flap decorated with a star shape in the form of a fire invoking pentacle. 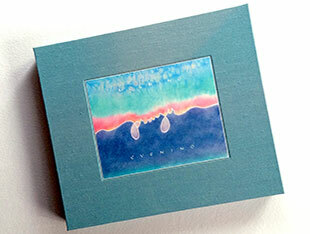 Edition of 53, signed and numbered. 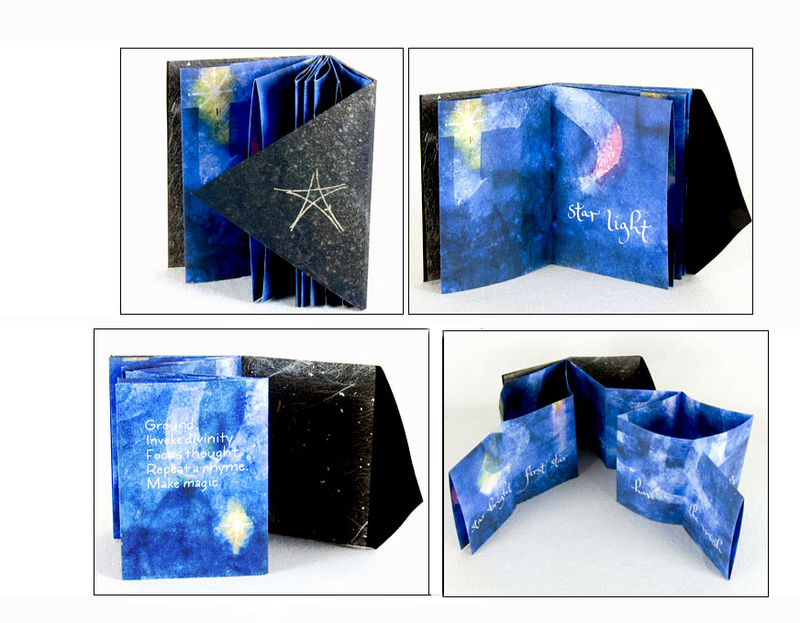 Deluxe edition (1 - 13): stars on front cover. Title and final pages laid with palladium leaf. Housed in a hand-painted slipcase. 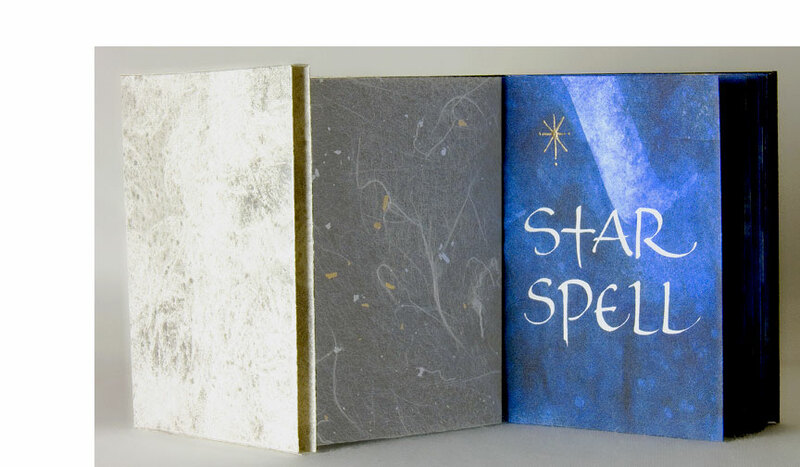 Standard (14 - 53): Stars handpainted in iridescent ink on front cover and title page. Cari Ferraro: "This book structure can be gently unfolded to see the large lettering on the painting in the background, and to find hidden words on the reverse near the binding. The last three images show the book in the beginning stages of unfolding; the next shows the entire flat page as it looks before cutting, folding and sewing, and the last shows the deluxe edition, with star gilded and silver painted white slipcase. 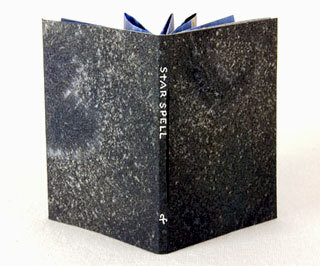 "A small magical book, using the familiar nursery rhyme, which fulfills the basic definition of a spell. The last page offers a haiku-like 17 syllable verse on the art of making magic, written by the artist. The old ways are often hidden in children’s fairy tales and rhymes, passed along in the manner of 'old wives’ tales.' Many such examples exist: see the books The Tao and Mother Goose by Robert Carter for an interesting examination of this theme, as well as The Uses of Enchantment by Bruno Bettelheim, and much of Joseph Campbell’s writing about mythology." San Jose, California: Prose and Letters, 2004. Edition of 50. 5.25 x 6.75" closed, 49" open; 8 pages. 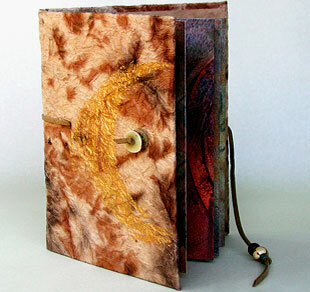 Handmade accordion book in Lokta paper-covered case with bead and leather closure, gold painted accents. Reproduced from an original hand lettered and painted book. Cari Ferraro: "I was inspired to create this book by the work of archeologist Marija Gimbutas, whose theory was that the first writing actually predated Sumerian businessmen by a few thousand years, and instead grew out of symbolic marks on ritual objects made to venerate the Great Mother in Old Europe. The idea that writing came out of a spiritual place rather than a commercial one appeals to me as a calligrapher. I invented an alphabet style based on Marija's catalog of marks, and in the background of the paste paper used symbols found in the 5000-year-old passage grave Newgrange in Ireland, whose meaning has never been fully understood. “ Though I wanted the book to open out to give a feeling of a cave wall, I also wanted to close, preferably by wrapping, so I made a case for it so that it opens like a regular codex, but with an accordion structure that can open out completely to see all the pages at once."